Try this simple and seasonal recipe for roasted butternut squash. In the grocery store years ago, my daughter Paige, who was probably 3 or 4 years old at the time, spotted a package of cubed butternut squash and got very excited. Cubed butternut squash can look a lot like her favorite melon. The flavor is certainly different, though. Don’t worry, I did clear up the confusion. Rich in vitamin A and C, butternut squash begins appearing in markets in late September or early October. A hard squash, it falls into the category of winter squashes. Frequently used in soups and roasted, it pairs well with herbs like sage and thyme, spicy ingredients (as in chilis) and with butter and maple flavors. The flesh of the butternut squash becomes soft and sweet when cooked. The skin of a butternut squash is thick and not edible, even when cooked. The seeds, however, can be roasted as you would with pumpkin seeds and enjoyed as a snack. As we enter the months of sweaters, scarves, gloves and fleece, warm, hearty dishes are a must. 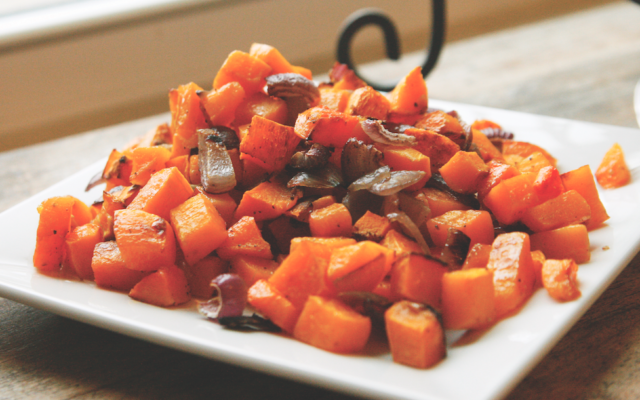 This recipe for roasted butternut squash with red onions makes a wonderful side dish on chilly days with its rich and robust flavor. You can even top salads with it, turning the normally cool side dish into a lovely warm one. Spread the butternut squash cubes over the baking sheet. Disperse the red onions throughout. Drizzle with olive oil and sprinkle with salt and pepper. Roast for 20 minutes and then stir. Roast for an additional 20 to 30 minutes, or until beginning to brown. Enjoy as a side dish, on rice or other grains, on salads or in wraps.